RSV4 Tuono and RSV4 R Version for 2010? 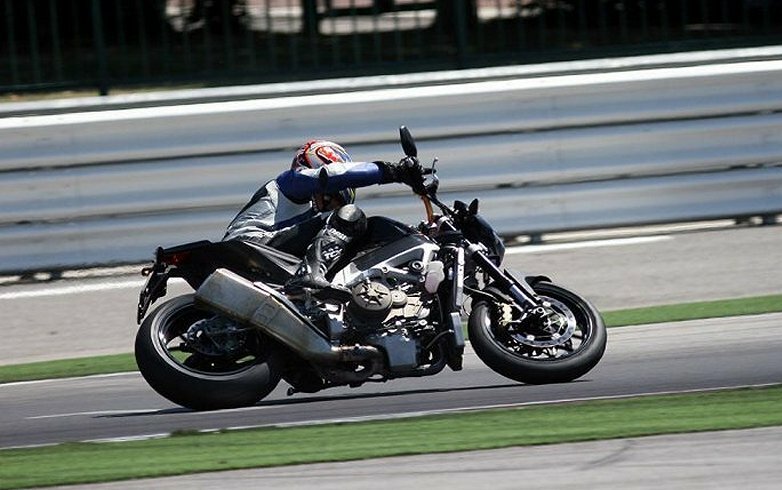 Both England’s MotorCycle News and Italy’s Motociclismo magazines have spotted a naked version of the fearsome Aprilia RSV4 superbike being tested at Misano racetrack. The new bike, which is stripped of bodywork and has a big fat tube handlebar atop the triple clamp, looks like a test mule; the final version should have vastly different bodywork, and yes, that giant shofar of a muffler makes me want to throw up a little in my mouth, too. The fairing shown looks much like the unit off the Dorsoduro: it would be surprising if it’s the final version. Another member of the RSV4 family, the RSV R, has also been spied. Expect that to have lower-spec suspension and other components, resulting in a lower pricetag than the big-bucks RSV4 Factory. The appearance of these bikes, along with Ducati’s Streetfighter and the new BMW S 1000 RR, makes me wonder: has Japan, Inc., fallen behind in innovation and performance? At one time our highways and byways were ruled by big Japanese standards, UJMs that you could tour, roadrace, cruise or do anything else on. European bikes were seen as slow, overpriced, unreliable and uncomfortable. Now it’s almost the exact opposite. Prices have come down, with the Ducati and BMW superbikes priced reasonably, reliability is much improved (yes, save your emails, we know it’s not perfect), and the bikes that get the most buzz are the ones shipped across the Atlantic rather than the Pacific. Heck, even Harley-Davidson and Buell have some good, affordable sportbikes and standards. Much of what’s coming from Japan, Inc., these days is race-tuned hypersports and me-too cruisers. Ironic that some of the most exciting UJMs these days are actually from Europe and the USA.